Anyone else feel like they just can’t get enough moisture these days? This never ending winter thing really takes a toll on us! Parched skin, chapped lips, dry ends…it ain’t pretty friends. But on the bright side, we’ve gotten pretty good at finding products that boost and retain moisture to help get us through this dry season. Sam and I are ALL about masks these days. 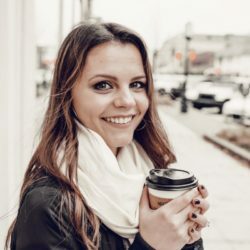 Whether we use them a couple times a week or every single day, masks seem to be the fastest, easiest way to bring our hair, skin and lips back to life. There’s nothing quite like waking up with luscious hair, glowing skin and plump lips. Like, hello! We’re ready for our closeup! So with that friends, let’s get into the three masks we can’t live without. Disclaimer: This post contains affiliate links. If you buy something through these links, you won’t pay a penny more, but we’ll get a small commission, which helps us continue to grow our CO brand. Regardless of this, we promise to always give you the most honest and real reviews about every product on our site. You hair is in for a major Moroccan treat guys! We recently received this hair mask in our FabFitFun box, and it was like love at first sight/smell/touch. Literally. My hair has never responded so well to a hair mask before! 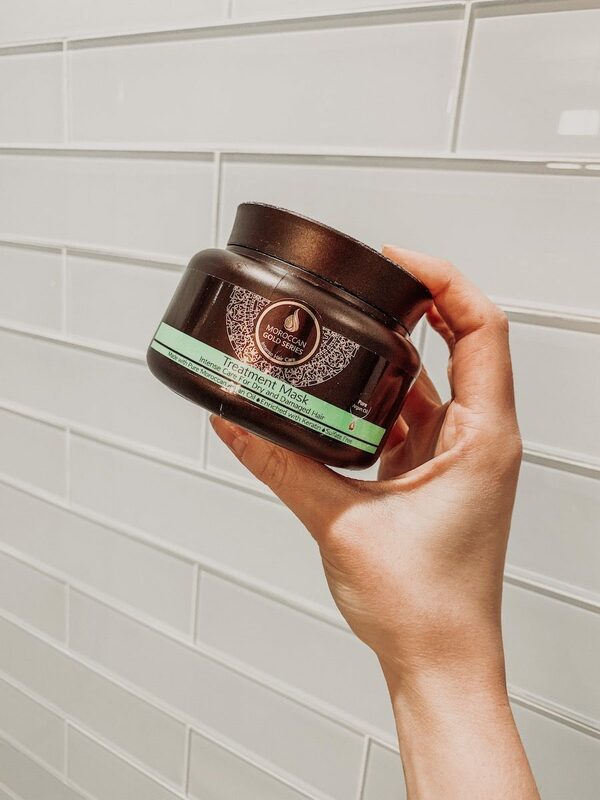 The Moroccan Gold Series Treatment Mask is made with pure Moroccan Argan oil and keratin, which help restore dry or damaged hair from heat or color/chemical treatments. Guilty anyone? We know we are! But are we ever seriously going to stop styling or coloring our hair? Nuh-uh honey! That’s what hair masks are for…duh. It smells absolutely divine! It actually has kind of a manly scent to it, which I totally love. But it’s not too overpowering! My hair feels sooo soft and light the day after. No residue or heaviness left in sight! It helps my hair stay cleaner for longer. The more moisturized your locks are, the less oil your scalp will produce! Wash my hair with one of my favorite shampoos, like Virtue! The result? 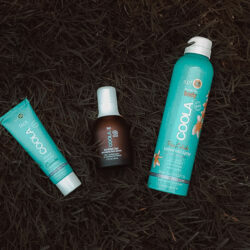 Bouncy, moisturized hair that looks and feels amazing. Now you know why it’s one of the three masks we can’t live without! Hey guys, Sam here! 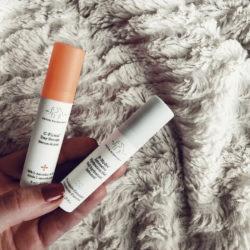 Being that I’m your resident Drunk Elephant aficionado, I’m here to tell you about one of my all-time favorite products from their line…the Babyfacial! 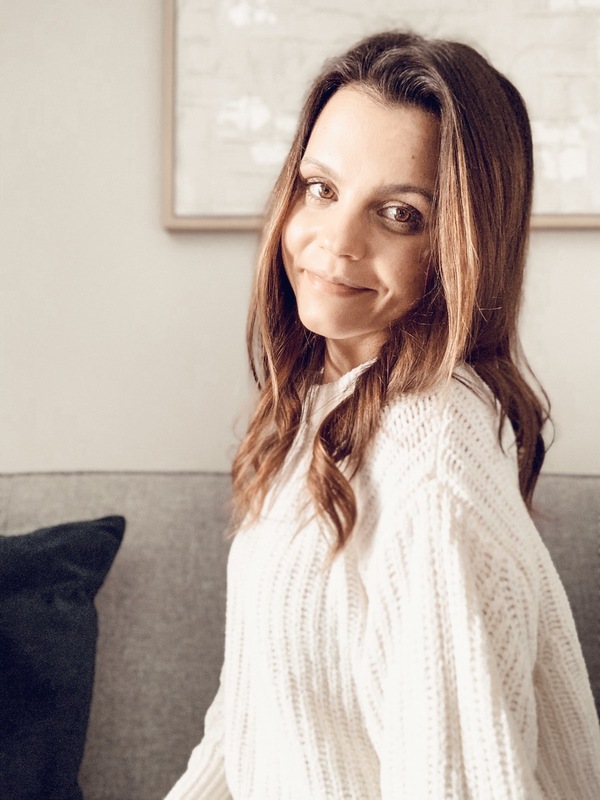 I actually purchased this mask back before my wedding in effort to achieve major results, in a short period of time, without having to actually get weekly facials at a spa! This power-packed formula of a mask is designed to totally revamp your face in a short amount of time. It’s a pro-quality AHA/BHA “facial” that works to resurface your skin to work towards clarity, evenness and an overall brighter complexion! It is powerful, yet gentle. It does some serious work with some serious ingredients (which may sting a bit when you first put it on TBH), but it balances it all out with gentle, restorative ingredients! 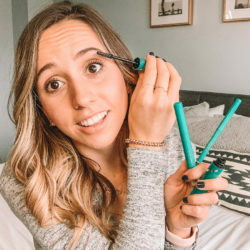 Note on this: I’ve totally strayed away from scrubs that damage my skin these days…using this product once every week or two weeks totally takes over the need for a regular scrub! I can see the results almost instantly. 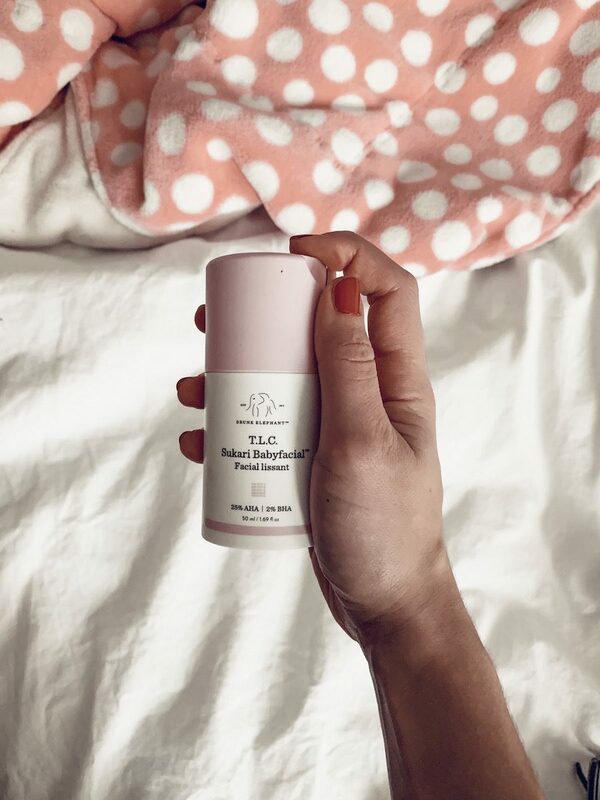 When I use this at night, I wake up with my skin looking fresh, clean and restored! It gets better with regular use too! Wallet-friendly facial. Sure, $80 for one product may seem insane! 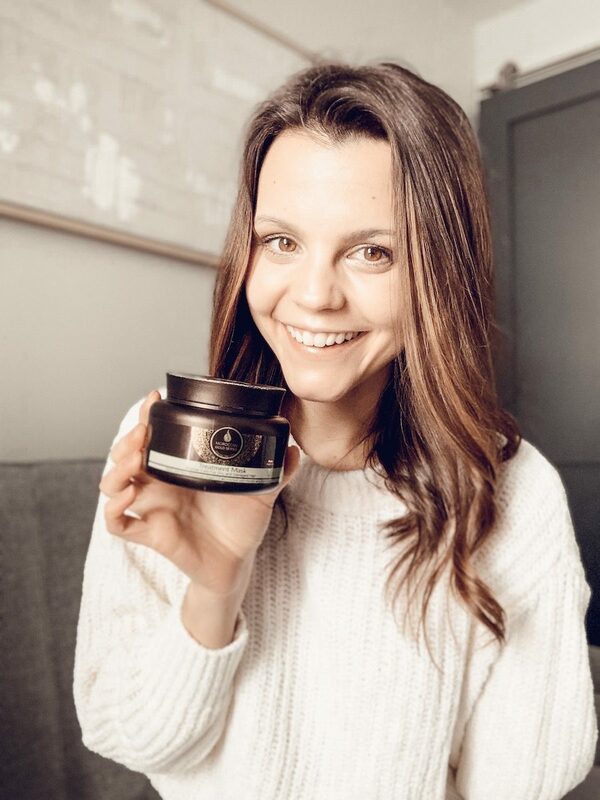 But when you compare the results of this mask to that of a $150 facial…and then realize that one bottle of this lasts FOREVER (I don’t even think I’m half-way through mine and it’s been 6 months!) it can’t not be a good deal. Take off my makeup using the Farmacy Cleansing Balm and cleanse my face using the Youth to the People Cleanser. Pump a nickel-sized amount of Babyfacial onto my fingertips and rub a thin layer over my face. Let it sit for 20 minutes! Honestly, the first 60 seconds are really uncomfortable for me, but the worst of it is over in no-time and then it feels like nothing! Voila! Visibly brighter and even-toned skin! There’s no wonder this mask has won a TON of awards. It just freakin’ works, friends! 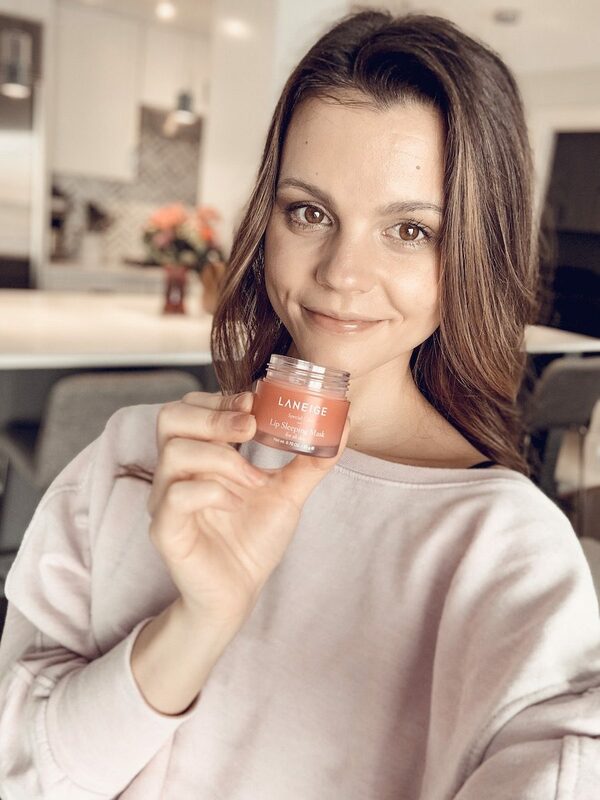 Sam and I first heard about the Laneige Lip Sleeping Mask on one of our favorite podcasts/blogs, The Skinny Confidential. 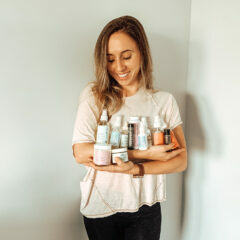 Lauryn Evarts is a skincare QUEEN, so of course we had to give her recommendation a try. I was a little hesitant at first because paying $20 for a lip mask seemed a bit absurd. But after Sam couldn’t stop raving about it, I knew I had to jump on the Laneige bandwagon. Am I too easily influenced? Perhaps…#sorrynotsorry. 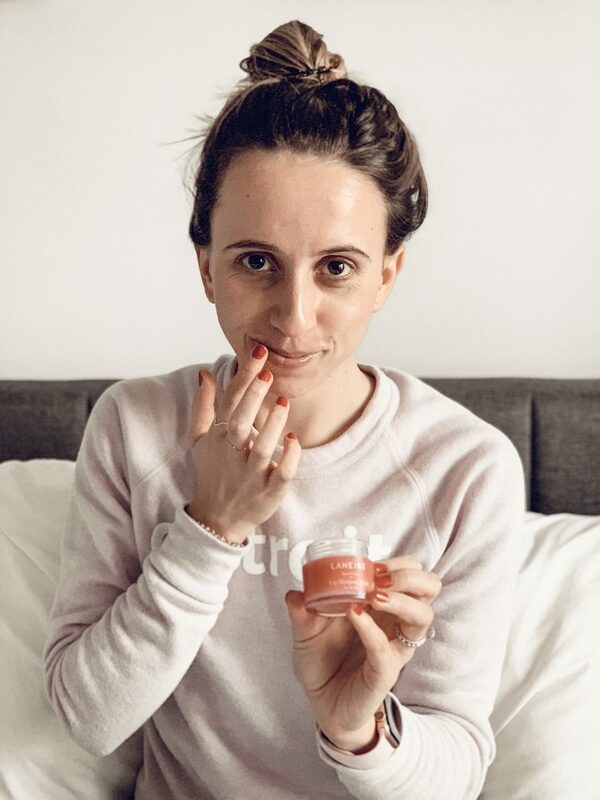 The Laneige Lip Sleeping Mask is a leave-on lip mask that helps to soothe and plump those precious lips of yours overnight. Like magic! It’s made with a Berry Mix Complex™, which is filled amazing antioxidants, vitamin C and a delicious blend of raspberry, strawberry, cranberry, and blueberry extracts. Talk about YUM! Our lips have never looked or felt better. Buh-byeee chapped lips! It smells and tastes like a very berry paradise. It’s the more “mature” version of that strawberry Body Shop lip gloss you were obsessed with in 2004. It’s not just for overnight! We literally use this stuff all day every day because it absorbs so easily into our lips. It’s hubby approved. Berry flavor and all. Got chapped lips in the middle of the afternoon? Laneige it. Got chapped lips after your workout? Laneige it. Got chapped lips after a steamy makeout sesh? Laneige it. Ok, you get the point. We use this stuff ALL. THE. TIME. At night, we make sure we lather on a generous amount. And throughout the day, we use this lip mask in place of our regular chapstick. It works that well! So there you have it, friends! The three masks we can’t live without. Comment below with your go-to mask this winter!